Camping Los Madriles är en camping i Isla Plana, Murcia. Denna terrasscamping har platser med stängsel, med skugga, utan skugga och platser med lite skugga. Det finns möjlighet att hyra husbilar. På campingen finns en lekplats och ett sportområde. Vem vill inte efter en hård dag slappna av i en jacuzzi. Campingen förfogar över en utomhusbassäng, en inomhusbassäng med skjuttak och ett knattebad. Denna inspektör gör varje år ett besök på Camping Los Madriles och inspekterar campingen för ca 200 faciliteter och för andra förekommande punkter. Inspektören är en medarbetare från ACSI och arbetar inte för campingen. Extremely well designed and engineered site, with level terraces on quite a steep slope. Although they say maximum 8m motorhomes, a 9m van will fit on big pitches diagonally. Toilet/wash facilities good. Laundry expensive. Staff speak English well and were very helpful when we had mechanical problems which forced us to switch to a bungalow temporarily. Village with a decent supermarket and social club bar only 10 minutes walk. The only downside was the atmosphere. Maybe it reflected the time of season (school time) but while we were there, the place was exclusively full of seniors and it felt like a retirement village. Way too quiet and some comments about young children being normal young children. I wouldn\'t recommend it for families. This is a good campsite in an interesting area. The pitches are a bit cramped, but some have very nice views from terraced positions to the coast. The things that let it down are the absence of hot water to wash hands, the absence of soap, and the absence of toilet paper. For a top-price site, this is poor. The internet is a bit hit and miss too, although seems to work if you are near an wifi aerial. The staff are very helpful. This site has excellent pitches on gravel, pitches are Separated by hedges. The swimming pools are superb. When we stayed the bar was rarely open so can't comment. The onsite shop was basic. Toilet facilities were good. The village of Isla plana is within walking distance and is an attractive small resort with a pleasant beach. Second time we have stayed here. This time we brought our bikes and explored the local area in more detail. Quiet, older site, though hilly. Lovely little town you can cycle to and lots of walking. Well serviced with toilet blocks, very nice pool. Can only get free wifi at the bar and library. Bar not open on Sundays and closes at times during the day! Pitches different sizes and can be sloping. Some table tennis tables and one tennis court. Will visit again although think the rates are a little high compared to some other sites we've been to. This is a delightful site, it's set on the side of a mountain overlooking the sea. The pitches are on large, flat terraces & have hedge boundaries with some shade. Toilet blocks are modern and clean. Friendly, helpful staff, bar, shop & very good book exchange. Amazing pools which are a highlight of site. Would very happily stay here again. Recommended. This was our second stay, visited same time last year too. At this time of year he site is relatively quiet with many of the long term people who overwinter leaving which offered a plentiful supply of excellent pitches available. It's a lovely week kept, easy going site with everything you need with the added bonus of the fantastic swimming pool. The wash lock half way up th site was closed for refurbishment - news basins and loos so will be good for later in the season. Our weather was very good although fairly strong winds whipped up on a couple nights. A day trip to Cartagena is very worthwhile with great view of the city and large Marina and harbour from the castle (panoramic lift is available) and for €8 the trip out on the 'tourist' catamaran which is a lovely hour long journey with the option of getting off at the fort at ChristmS Island. Lovely bars on the beach at La Azhoia not far away and several restaurants to choose from, although some closed at this time of year. We fully recommend this site, and again stayed for a very enjoyable week of rest and relaxation. This was our second choice of site in this area but having looked at our first choice first we dismissed that one straight away. This is far superior in our opinion. Despite my observations following we would recommend this site and would return if in the area. A very well maintained and laid out site. Efficient reception staff. Big plus is 2 heated saltwater pools, one indoor. Small supermarket, not very well stocked but there are two local supermarkets, one in Isla Plana and one in la Azohia, the first being the nearest and in easy walking distance. The toilet and washing up etc facilities are abundant and spotless and there are countless washing machines. The site is well laid out with clearly marked hard standing pitches, having many flowering shrubs and trees and there are sea views. The following are points we would consider if we came to this area again... we chose a pitch low down (the site is terraced but not steeply and pitches are flat) and close to the central site road, which therefore means that everyone leaving or entering the site, in vehicles or walking to the pool, supermarket, table tennis etc has to pass by. This may not bother most people and sounds a little petty, but when cars stop and the occupants chat for ten minutes with passers by, leaving the engine running it can be a little irritating! It is really a personal choice. No charcoal barbecues are allowed, although the ACSI guide says all types are allowed. To a point this is true but the barbecue area is at the top of the site and not centrally situated. We were told in no uncertain terms by the manager, when he saw us carrying a bag of charcoal... that we were not allowed to barbecue, "told" from one side of the road to the other and he shrugged his shoulders and laughed when I suggested he inform ACSI. There is a very well stocked book and games room where the wifi is free. It appears, having been "told off" for talking, by another customer (who, herself, was constantly talking to her companion), that this is a "quiet" room, however it contains a TV with a DVD player, so who decides? There is a bar but the opening times seem a little vague. The wifi is available for a charge, throughout the site (on a scale, we paid 17€ for 14 days) but very intermittent and perhaps not worth it if you only need to check something occasionally, we choose wifi for the benefit of English radio, and unfortunately the payment did not afford us much benefit. There is a bus service to Cartagena, worth the trip we thought but the service is extremely infrequent, and also travels in the opposite direction to Mazarron. Puerto de Mazarron is cyclable but not a very pleasant road, quite hilly and windy, I would say not a child friendly cycle route. There is however a cycle path starting almost opposite the site to La Azohia. The other notable thing is that the road numbers have changed from the 2014 Acsi guide and even with 2 GPS systems we managed to get completely lost. Overall an excellent site. This is a large commercial site which had been very well laid out with nice pitches. The toilet/shower facilities are good and everything worked very well. The site is a long way from the beach and town if you're walking so a bike would be good in this area if you don't want to drive. Lovely campsite close to the beach. Good sized terraced pitches with views over the bay. Ideally placed between Porte of Mazarron and Cartagena. Two aspects could make it great. 1. Free Internet access only available in the cafe. 2. Cafe shut at 6pm. For information - the campsite isn't close to many amenities. Although many campers had bikes to get to the small town of Isla Plana and beyond, it was a bit of a hike to walk. Vill du boka Camping Los Madriles eller få mera information? Det går bra med nedanstående uppgifter. 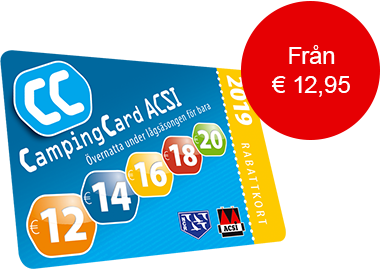 ACSI Eurocampings skickar din informationsförfrågan till "Camping Los Madriles".